Some Great Sailing Links and Reference Books! 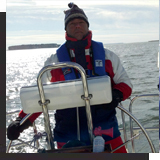 Read about some of my sailing adventures and view photos. Contact Captain Mark Chest for professional instruction or delivery. He's the best! Great for all your sailing supply needs. Charts, safety equipment, electronics. Easy access to all the products available at the ASA store - books, clothing, safety equipment, and much much more! Captain Ron has spend the past few winter seasons aboard his boat in Key West, FL. Check his blog. Within walking distance of the marina, only 2/10 mile. Has an inside pool, spa, exercise room, and continental breakfast. Just a short 1/2 mile from the marina. Has a great view of the south side of Kent Narrows, and a great pool! Overlooking the marina. Only 2/10 mile to the front gate. Has an indoor pool. Great crab house overlooking the north side of Kent Narrows and just outside the marina gate. Two great restaurants. Just a short walk to the south side of Kent Narrows. Another great restaurant with great crab entrées. Penny and I recommend you plan a visit - fantastic food and great ambience. Take JD's Taxi Service to ride there ((284)496-6841.